Allow additional time each morning due to high traffic volume around the campus. Carpool, bike or walk to help reduce the volume of vehicle traffic. Drop off location is designated at the front of the school. 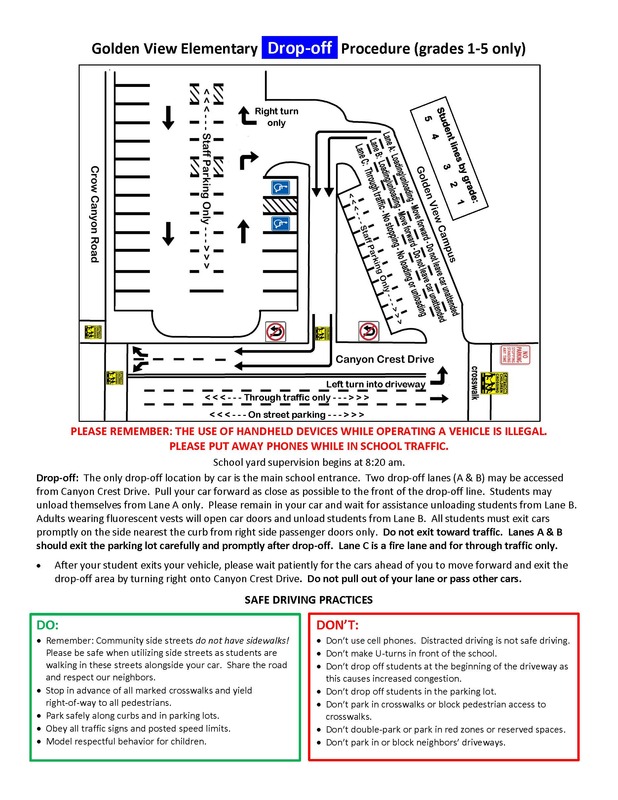 Cars MUST be parked in a designated spot for students to exit a vehicle safely. Double parking blocks the visibility for walkers and drivers creating a safety issue. Be respectful of designated Auction Winner, Handicap and Staff parking spots. (These are clearly marked). Park on the street and walk student to kinder blacktop. Students line up on yellow lines in the kinder playground area. Signs will be posted where each class should line up on the first day. Stay with student until teacher opens classroom door. NO playing on playground equipment or race track before school. Please do not park in kinder driveway. Buses will be dropping off TK students in the front of the TK/Kinder lot. Please park on street and walk your child into the kinder playground area. Those students attending the YMCA will be walked over by YMCA staff. organization, please let your teacher know via email. AM Class: Dismissed at the front of the school, at the main entrance. Follow documented pick-up procedures above. PM Class: Park on street and walk to pick up student at kinder playground classroom door.